Well, surprise, surprise, the McLarens and Ferraris are evenly matched yet again. Although Hamilton and Alonso headed the time sheet, the Ferraris are so close behind that it makes little difference; and anyway, they always reckon that they race better than they qualify. So it is looking like we will have a very close race to decide who will be champion in this acrimonious year. I am beginning to forgive Alonso already so it matters not a great deal to me who grabs the title tomorrow and I will be able to enjoy the race for its own sake. And I refuse to even mention the latest storm in a teacup, the matter of how many tires are allowed in a session and what sort of penalty be appropriate for infringement. So McLaren make mistakes sometimes? So would you if you were under the pressure the team has been subjected to this season. Instead, I want to point at the performance that should have us all eating our hats (fortunately, I don't have one). Williams' young test driver, Kazuki Nakajima, managed eighth fastest, only a hundredth of a second slower than his wonder boy team mate, Nico Rosberg. This was entirely unexpected, Nakajima having looked good in GP2, where he has consistently finished on the podium in the second half of the year, but surely not that good. It may be a flash in the pan and Nakajima might fare worse in qualifying today, but he has already taught us not to be so ready to pre-judge new drivers. Just as some find the step up to F1 a little beyond them, others take to it as though born for the task. I hope the latter is the case with Nakajima as F1 needs a really talented Japanese driver; they have been knocking on the door for years now but never quite managed to reach the top. 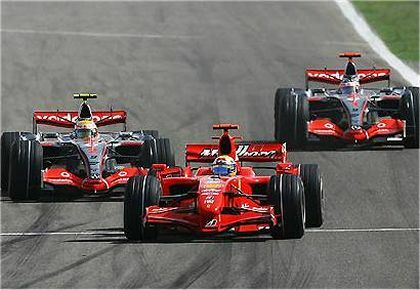 Ralf Schumacher continued his run of good form now that his tenure at Toyota is clearly over; he finished with eleventh fastest time, five spots ahead of his nemesis, Jarno Trulli. And no surprises (except for the Vettel supporters) at Toro Rosso - Vitantonio Liuzzi was quicker than the rookie yet again. The Renaults looked pretty good, Fisichella providing a minor upset by being considerably quicker than the improving Kovalainen and pushing the BMW boys out of their usual places. But Kubica and Heidfeld will be back up there come qualifying time, I'm sure. Essentially, it is no change from the expected order. That should be even more the case in qualifying since it is forecast to be dry - no Toro Rossos getting in amongst the leaders therefore. The race is expected to be dry too and, in a way, that is how it should be. The title decider ought to be a straight shoot out, unaffected by such wild cards as rain. Let them fight it out fairly and may the best man win! That's the danger of making predictions, Number 38 - sometimes you get it wrong! Alas the wishes have been ignored and the FIA are still doing what they do. Nevertheless we are in for one of those 'End of Season' thrillers that keep us all enthralled. All I can say is - Go for it Ham! With the proviso that Kimi is in the mix and the race will let the Ice Man through with a few laps to spare. I try to keep Sundays off, if I can, although I watch what's going on still. I've seen the fuel controversy develop and then deflate but stuck to my guns - you'll hear what I think tomorrow, once I've had time to digest the GP and subsequent events. But I think the result will stand. Everyone, and especially McLaren, is thoroughly fed up with litigation and points changing hands in the law courts - they'll let it go. In here the day after the championship was decided, and not a word from you about the titelwinner or what happened in Brazil. But, well, this is a blog, and not the reuters homepage. Quality comes with time. I just thought that i had to spew some words on the FIA again, those old bastards have really began to loose control. I mean, there's rules in this sport that have never been used, inposed just to ensure there possibly could be some mysterious penalties i a couple of decades or so. And, what is this they are doing, always finding something wrong, finding the coinsiding rule, but then, there's no clear penalty. Since FIA is so damn eager to ceep things fair in the racing, can't they have rules with the penalties allready set? Like it is with the engine-rule. If youchange engine, you get 10 place penalty on the starting grid. Simple as that. If you spy on another team, you loose 50 million pounds. Not hard to remember, and definitly the way a title-contender would look if they want to be really serious about the titlerace. You may think i sound angry here, and yes i am. I have lost all of my trust in the FIA, and if there's not a serious change til next season, i have watched my last race. Sorry for using your precious blogspace to write off my feelings, but i could not find any other space on the internet where's people care more about the sport than here. "...I could not find any other space on the internet where's people care more about the sport than here..."
I agree with you entirely, Björn - the FIA is ruining the sport with its obscure rules and constant interference. But I have hope that their incompetence is becoming so clear to everyone that the powers that can bring change to the FIA will awaken and do something soon. Events are transpiring in Italy that might well hasten this process.